Ben Patterson was joined by MPs, MEPs and Senior Conservative apparatchiks this afternoon to launch his new range of illuminated headwear. The "Bringing Light to Life" range was specially developed to illuminate the dark country lanes whilst campaigning for a YES vote in any future EU Referendum. KCC Leader, Paul Carter also attended the launch and declared he would be an early purchaser of the new range, as it might help him see light at the end of the tunnel. 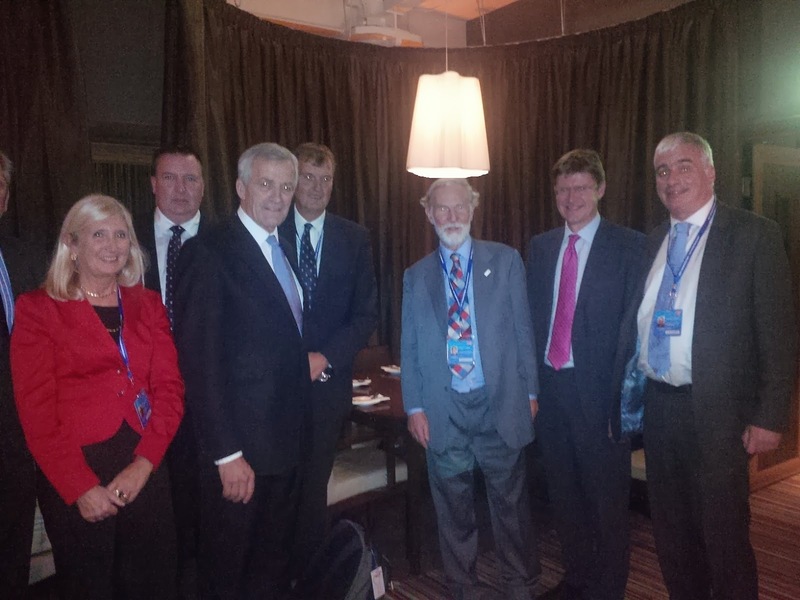 The range was launched at the Kent Conservatives' Afternoon Tea at Manchester's Abode Hotel this afternoon. Eh, Gladys, what does that mean...? Overheard this morning in the main conference hall. Platform speaker, "...and we must reach out to the BME Community." Two old ladies in row behind me, "What did he say, Gladys, the what community?" 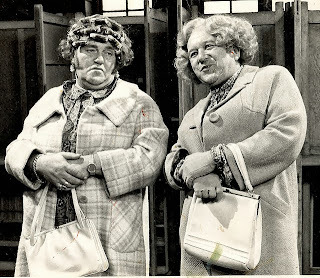 Gladys, "I think he said the BME"
"Oh. Right. What does that mean, then?" "BME Community? I wonder if the B means Black? It could be black, Gladys." "Could be, could be. But if so, what about the M?" "Hmmm. M? Muslim? The black and Muslim community. That sounds right." "That's it, well done. The black and Muslim Community. That makes sense. What about the E?" "Got it! European. We must reach out to the Black, Muslim and Europeans." "Not so sure about reaching out to Europeans. I never voted to go in in the first place." People often ask "how was conference" to which I reply, "what little I saw was fine". Like many seasoned conference-goer the events and set-piece speeches inside the hall are the justification for self-indulgence which goes out outside it. Yesterday was a case in point. My day started with kippers (the gutless rather than the brainless variety) before forcing myself to miss the annual meeting of the National Convention (safe in the knowledge that Sally Roberts would tell me the highlights). I set-up base camp in Starbucks and watched the arrival of the great unwashed with their placards (I am referring to Unite not the membership). An early highlight was a chance encounter with Stuart Holmes. I went across the pat the dog, which appeared to have better judgement that its owner. After a few informal meetings, mainly about West Kent, I ventured into the Midland Hotel for ConHome's fringe meeting with Lord Ashcroft. Towards the end I bumped into Peter Botting and I suggested a "quick drink". And from on it went downhill (which considering it was only 3pm, didn't bode well). We commandeered a table in the bar and foolishly deluded ourselves with two small gins with tonic. These immediately turned into two more gins without tonic as we decided it was impossible to taste a single gin, then two more and many more on top. The empty seat next to us was like a casting couch as various friends and colleagues turned up, shared a drink and left. Then suddenly the PPCs swooped (I suspect Botting had sent out a text to his clients "The T&M agent is here and is guard is lowered". They circled like vultures, trying to look nonchalant and totally disinterested, whilst waiting their turn. As soon as the seat became free they swooped; it was like a game of musical chairs to a backdrop of "Take a Chance of Me". Peter asked one passer-by "which seats are you applying for" to which he replied "Newark, Croydon and Tonbridge - though I suspect Tonbridge might have a few too many Country Cousins for me". "Hello", I said, "I'm the Country Cousins' Agent". The sound of frantic back peddling against the sight of blood draining from his face with a wonder to behold. By 7pm we had been joined by friends from West Kent. At this point I realised I had been sitting there drinking large gins for over four hours. I needed the loo, but thought it was safer to remain seated. In my high-backed chair with arms I could come to no harm, and given I am able to speak fairly coherently even when drunk, I was safe. Walking to the loo might would almost certainly give the game away. By 9pm it was decided we needed food (probably just as well as I had thus far survived on a kipper at 8am). I hauled myself to my feet and was pleased to discover my legs still worked, and we headed-off in search of pizza. And that was my first day in Manchester. I will try to be a better Tory today. Ten years ago when, as constituency Chairman, I ran a Parliamentary Selection, there were none to be seen. Five years ago, when we selected Tracey Crouch for Chatham & Aylesford, there were a few. Now 30% of CVs have them. And just like overused exclamation marks, they sadly do little to enhance a narrative, and may even irritate the reader. attention-deficit brother who gets over-excited and breaks things and laughs too loudly." 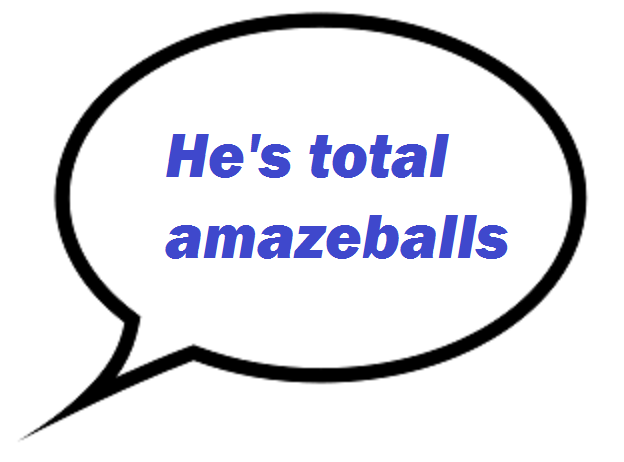 And many might say the same about the speech bubble. In fact, there are now so many of them, and they are all placed at the same point on the page (i.e., the first one 4 inches down on the right, the second one 3 inches below the first on the left) that it cannot be a co-incidence. I suspect that some well-meaning "consultant" is charging candidates a small fortune to advise them on how to make their CV "stand out from the crowd" with exactly the opposite effect. 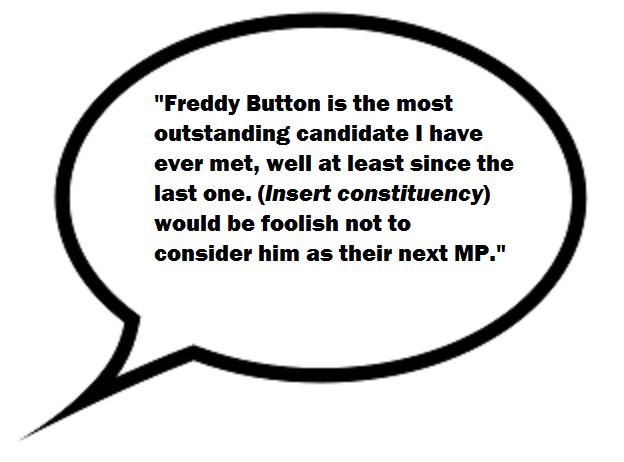 The other risk applicants take when including endorsements and speech bubbles is the very high chance that one of the Sift Committee might dislike or distrust one of the endorsers, and hold it against you; and that risk is multiplied the more endorsers you have. Many CVs have as many as six. And then there is the understandable question about whether the fact that Alan B'Stard MP thinks you "worked very hard" is a real reason to consider you as a potential Parliamentarian? I suspect many members of a Sift Committee would consider such second-hand views as totally irrelevant. Then we have the downright amusing; the cases where two or mor CVs carry exactly the same quote from the same MP; "(insert name) is the best campaigner I have ever met". Really? Can they both be the best campaigner ever met? "Sarah's majority of 750 was down in no small part to a army of willing volunteers, who put personal interests aside to campaign where it really mattered most. I am grateful for your hard work and support, and for helping deliver an outstanding victory in a seat Labour really needed to win." "Sarah's victory was down in no small part to you. 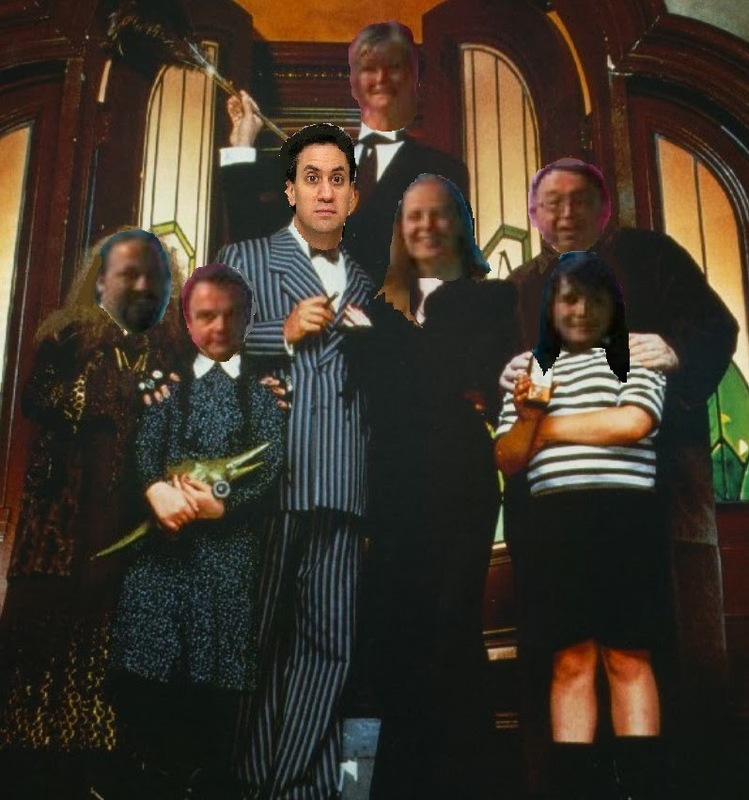 Thank you for putting your personal interests aside to help us defeat Labour." I am happy to acknowledge that the above selective quote has not materially changed what I originally wrote. However, I don't think anyone who read the original email could be in any doubt that it has been taken out of context. Such a willingness to "adapt the actuality" would lead me to question the validity of many other such quotes too. Would an MP, turning to an activists after a tough by-election and saying, "well done, you have worked harder than anyone for this result" subsequently turn up on a CV as "You are the hardest working activist". I suspect in many cases, this is exactly what happens! I have just enjoyed a very nice lunch at my hotel, sitting outside on the terrace overlooking Piccadilly. I had a "seafood platter" which was three small pieces of fried fish, a fishcake, salmon mousse and squid rings and fries. It was very nice, though at £15 not outrageously expensive. I also had two glasses of Champagne, which I agree is an indulgence, but I paid for it out of my taxed income. 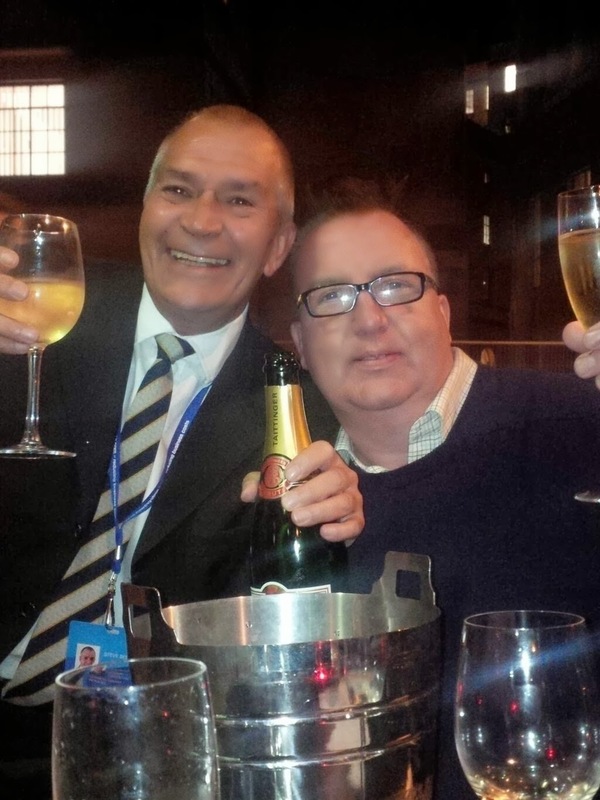 @Andrew__Kennedy Nice bit of scoff you got there big man,up in Manchester for a wee jolly? if U R hand back FREE travel pass £tax grabber! What was ironic is Piccadilly was thronging with Manchester United supporters going to the Man U v West Brom game. Most were wearing Man United shirts at £50 a time, and they will all have tickets at £30 - £60 a ticket. No-one would (or should) ever shout abuse at them for the spending plans. Their tickets cost 3x the cost of my food and their shirts 2x the cost of the one I am wearing from M&S. In the "Virgin Trains First Class Lounge" at Euston railway station. I am so pleased I didn't pay full price for my ticket! It resembles a corporate "break out" room at in a 1960s Post House, staffed by surly Eastern European female shot putters in search of fight. At least there is fresh coffee and Wi-Fi. The train journey to St Pancras was depressing. I appreciate that I run the risk of sounding like Alan Clark, but all around me were signs of the detritus of modern life; track-suited, pierced, tattooed, nose-picking, phlegm-gargling, crotch-scratching monosyllabic grunters. How did this wonderful nation create such a tribe of oiks, then, even worse, allow their feral behaviour to become acceptable? 10:57am: In the train and on my way. The "Assistant Train Manager" has handed-out "snack packs". When I declined she was amazed. "But it's free", she said. Everyone else has grabbed the freebie. Each box contains jelly beans, miniature Ritz crackers, a little pot of processed cream cheese and chocolate covered raisons. I am now surrounded by a sea of slack-jawed, open mouthed masticators. I loath public eating. It's like airline food; why, on a two hour flight, do the airlines feel the need to feed you, and why do people who have breakfasted just an hour earlier feel it necessary to grab and consume what they are offered ? Because it's "free". The young guy sitting opposite has left his seat fourteen times in 20 minutes: five times to get food from his bag or put something into his bag, twice to walk up and down the carriage, stretching and yawning, twice to get his Kindle then a battery charger, then three trips to the bin with food waste and to chase the "Assistant Train Manager" along the aisle to ask for a second "snack pack" as clearly he needs two tubs of processed cream cheese at 11am, Ghastly. Right, that's it. Rant over. I am going to read my Spectator and banish from my mind this dystopian world. PS - since typing the above paragraph, he's been up and down twice more. That's sixteen times in less than an hour. He's returned from (I guess) the lavatory where he has changed into a suit and is now standing in the middle of the train, in his socks, combing his hair and repacking his suitcase. Why would you do this? 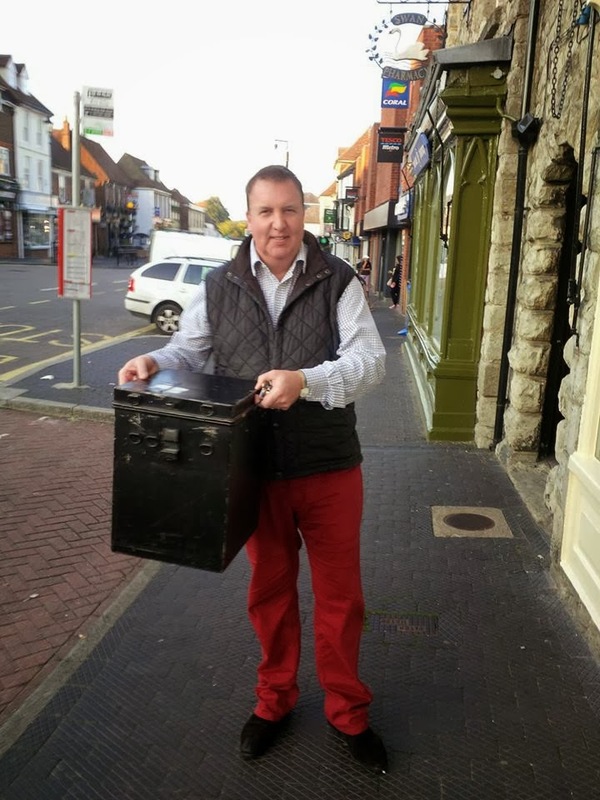 I was pleased to be interviewed by BBC Radio Kent today, promoting our Open Primary. Understandably, they only used a fraction of the interview, and left out my best bits (including my references Falkirk and Labour still being controlled by Unite). However, I think I got the message across. Scroll to 41minutes 40 seconds. The first batch of letters inviting residents to the Open Primary came off the laser printers a few moments ago. This first batch (1,200) are for donors and helpers who are not Party Members. These will be packed over the weekend and posted on 10 October. You might think we have started this very early, however by the time Jon and I return from Manchester, there will be just four weeks until the final selection (and we are required under the Rules to give paid-up members three weeks advanced notice). Once we have written to donors, helpers and members, we will write to all first time voters then start organising the door-to-door delivery! The Grand Old Man of Tunbridge Wells' UKIP insurgency, Vic Webb, was the cause of much amusement at yesterday's meeting of the Licensing Committee when, having ranted against a proposal to allow street traders, promptly seconded a motion from Conservative councillor Julia Soyke enabling the necessary change in law. When the vote came, he announced, "I oppose this and am voting against", before being reminded that he had actually seconded the motion in support a few minutes earlier. According to one witness, Vic suddenly changed from Captain Mainwaring to Corporal Jones, or as Vince Cable MP put it, "a transformation from Stalin to Mr Bean". This is the same Vic Webb who, having failed to gain a County Council seat in Tunbridge Wells South last May, spoke to the press and said of his UKIP colleague, who had just won a seat from us, "Personally, I would have preferred t to have been one of the more capable UKIP candidates who was elected." As I expect you can imagine, it's been a but frantic. The CVs are in and all copied for the Sift Committee, who are calling to collect them tomorrow. For the record (as you might as well hear it from me, rather than wonder whether you should believe the rumours) there were exactly 100 applicants. Nowhere near as many as we were expecting. A few calls to people we were expecting to apply but who did not do so indicated that many were dissuaded as they felt the seat was simple "out of their grasp". This is a shame, but it was their decision and the chance has now passed. One of the things I often hear from friends on the Candidates' List is how little information they receive, that they are often only called for interview at a few days notice (having to cancel events already in their diary) and that they too often find out that they have not progressed to the next round when they read it on Conservative Home. We are determined to treat all applicants fairly and with respect, and to this end our first task was to data capture their names and addresses and send them each an email, thanking them for their interest, setting out the timetable (so they can hold dates and plan their lives) and explaining the local process. Once again, for the sake of transparency, a copy of that email may be read HERE. One question I will be putting to CCHQ once it is all over and the dust has settled, why is this still being done on paper? Surely if we expect local government candidates to complete an electronic application form, which can be emailed, we can ask our parliamentary candidates to do likewise? Already over 100 residents have booked to attend! Not bad in four hours! Then a call from Joyce Gadd, President of Chatham & Aylesford Association, who was in charge of the Envelope Packing Team. They had run out of supplies and work was grinding to a halt. This took priority as 500 additional Christmas Draw reply forms were printed and sent around as a matter of urgency. I learnt very early on - don't upset the envelope packers! (Joyce did kindly send back a tin of home made chocolate cake - which was gratefully received). I then signed-off the design of the invitations, which will be delivered to 25,000 homes in the weeks leading up to the Open Primary. These are going to print tomorrow and will be with us next week! Do remember to write your name on the application form. It would be a tragedy if you were selected for interview but we didn't know who you were! If you are going to lift whole paragraphs from the agent's briefing note and insert it into your CV, try to remember to correct my spelling errors! If you are applying for a Kent constituency and wish to reinforce your support for Kent's outstanding education system, try to remember that we have Grammar Schools and not Grammer Schools. Off for a Chinese meal - over and out! Open Primary - details and dates. Earlier tonight the Tonbridge & Malling Executive Council voted overwhelmingly to hold an Open Primary to select the next Conservative candidate for this constituency. Obviously I am personally delighted at this news, though, of course, it was solely a matter for the members and I rightfully did not vote or speak until the members had decided. That being said, no-one who reads my blog could have been in any doubt where I stood on the issue. My passionate support for an Open Primary is based on the simple premise that we must start engaging with people on their terms, not excluding them if they don't accept ours. Politics is changing, and we must change with it if we are to attract the voters and activists of tomorrow. The days of candidates emerging from private meetings in smoke filled rooms are over. As Labour have found to their cost in Falkirk, trades unions buying discounted membership so they can gerrymander the contest to get one of their "own" selected does not go down well with the voters. And rightfully so. I was very proud of our members tonight. The rules on selections state that constituencies with fewer than 300 members are "strongly expected" to have an open primary. In T&M there are 700 members and they could quite easily have insisted on a closed selection. It is to their enormous credit that they didn't do so. Praise must go to the Officers, led by the Chairman, Jacques Arnold, for unanimously supporting and promoting this new approach. Tuesday 8 October: a "sifting committee" (elected by the Executive Council) will meet and select 10-15 applicants to go forward to the next stage. Saturday 19 October: There will be a series of assessment tests involving all applicants. This will include street stalls and traditional door-to-door canvassing, allowing an opportunity for voters to meet the applicants and for members of the interview panel to see the applicants at work and judge how well they are received by members of the public. Saturday 26 October: In depth interviews with members of the Executive Council. This process will reduce the field to a final shortlist of up to 4 applicants. Saturday 2 November: The final. A big, inclusive open meeting which every local registered voter will be invited to attend. Residents will have an opportunity to ask each of the applicants why they want to be our MP, what qualities they will bring to the job and how they will make a difference. Unlike Labour where the unions have special privileges, in the Conservative Party every vote will be equal and every vote will be count. It really will be a case of LET THE PEOPLE DECIDE! Having taken this truly momentous decision, the Executive Council is now determined to do all that it can to deliver the most open and exciting contest possible. A new blog has just been launched: www.tmselects.blogspot.com. This will carry news and updates at every stage, keeping local residents, the press and applicants informed at each step of the way. When the finalists have been selected, their CVs and personal statements will be published so every interested person can see why they wish to be our next MP. 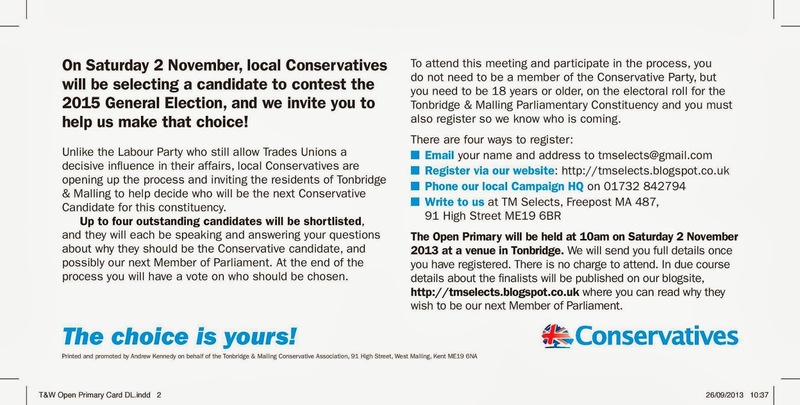 Residents can also register to attend the Open Primary via the Blog or by sending an email to tmselects@gmail.com by phone (01732 842794) or letter to TM Selects, Freepost MA 487, 91 High Street, West Malling ME19 6BR. Invitations to attend the Open Primary will be delivered to tens of thousands of homes. There will be street stalls, posters in shops, leaflets on shop counters - and we will be making a special effort to involve thousands of first time voters in the process. GOOD LUCK TO ALL THE APPLICANTS - LET THE CONTEST COMMENCE! Quick on the draw ! 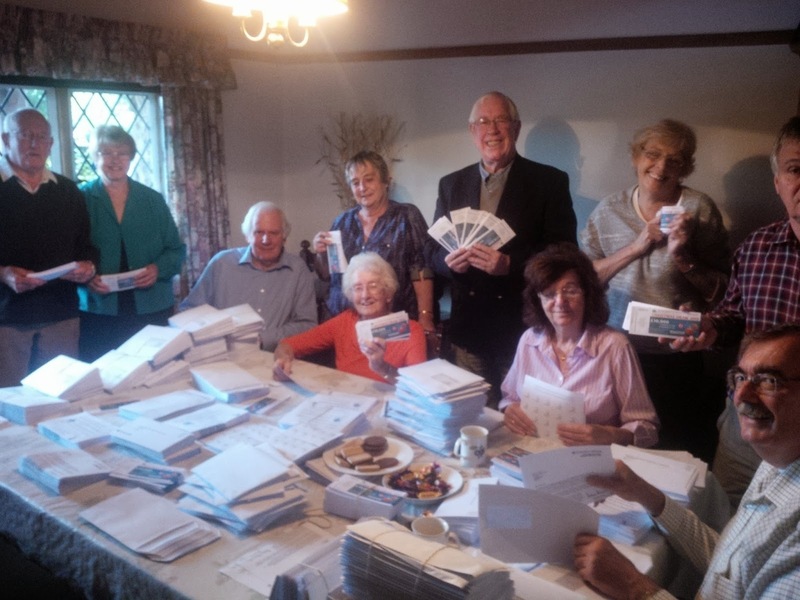 Today they are packing 6,500 envelopes of Christmas Draw tickets, which we are hand-delivering to pledges across the constituency in November. A good way to raise campaign funds from people who are happy to help and support the party, but may not want to join. I have never understood why more Associations don't do this? Tickets may be ordered (at no cost) from National Conservative Draw's Society, who retain 30% of sales to cover costs, the remaining 70% is returned to the local Association. First off, I will declare my interest. I have known Iain Dale for 6 years. He has kindly addressed conferences I have organised and often helps to promote my blog by linking to it from his. I therefore watched the footage of him grappling with an anti-nuclear protestor on Brighton seafront with amazement and horror; the kind of horror reserved for when you see your parents dancing to the Birdie Song at a family wedding. As a Libertarian I obviously support the right to protest. Nor do I like violence. Had the man been protesting against Damien McBride, or against former government employees making money from their memoires, then I would have defended him to the hilt. But he wasn't. 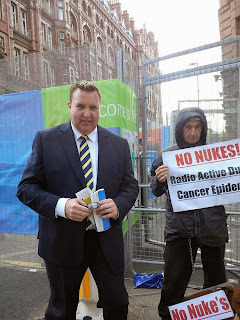 He was protesting against nuclear power, which is nothing to do with the odious McBride, or his book. For example, if someone had a legitimate grievance against Marks & Spencer I would fully support their right to hold up a banner outside M&S to raise their concerns. But should they also have a right to do at Selfridges, perhaps effecting Selfridges trade and reputation by default? I am not defending Iain's actions, but nor I am not going to shed crocodile tears on behalf of the protestor. The most amusing part of the whole incident was the man's dog, rather than defending his master against attack it turned on its owner and bit him on the backside. Not a good day for dog-owning men on Brighton seafront. New candidates' evening - a great success! with our first group of potential local government candidates. 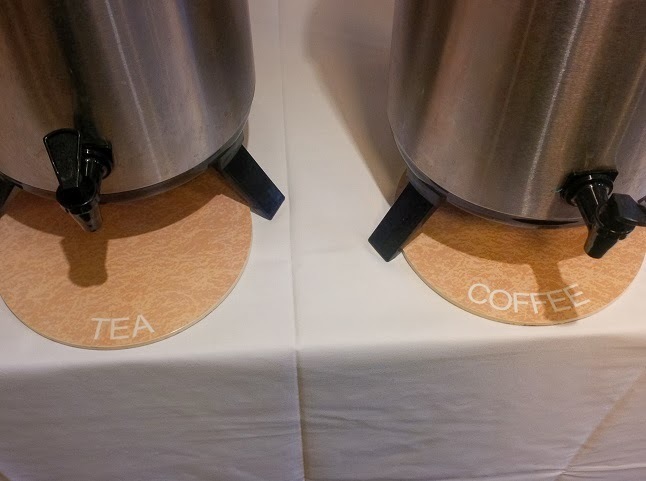 contains tea and which is the coffee?" asked Jon Botton. Me: "The clues are out there, Jon. The clues are out there!" Any job it can be repetitive, and much of what I do is routine and far from glamorous. Writing this blog brings this home; often I return home at night and have to think very hard about what I can talk about. "Mail merged 3,000 letters, data captured 200 surveys and answered the phone" are often the highlights of my day! Determined to deepen the pool of potential local candidates, the Associations invested considerable resources into identifying new people from the wider community. For background information, see HERE. 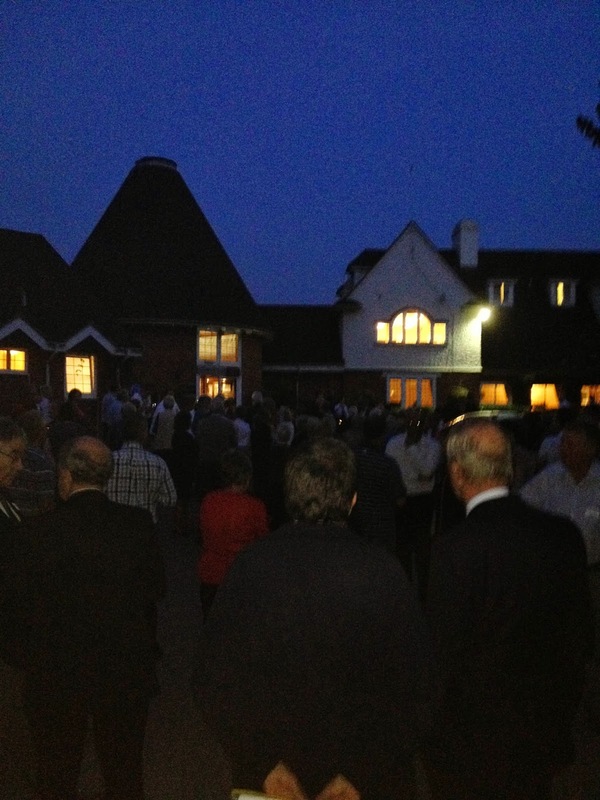 Tonight, we hosted our first open evening at the Mercure Hotel in Pembury. We deliberately selected a smart hotel with proper conference facilities, to present a professional image and to ensure attendees and the hosts were comfortable. I spoke about the selection process and how we approach elections and campaigning. I suspect parts of my presentation were too technical for a new audience, but I was determined to be open and honest about what would be expected of them if they apply and get selected. There is absolutely no point in airbrushing over the harsh realities of campaigning then complaining when they don't "pull their weight". 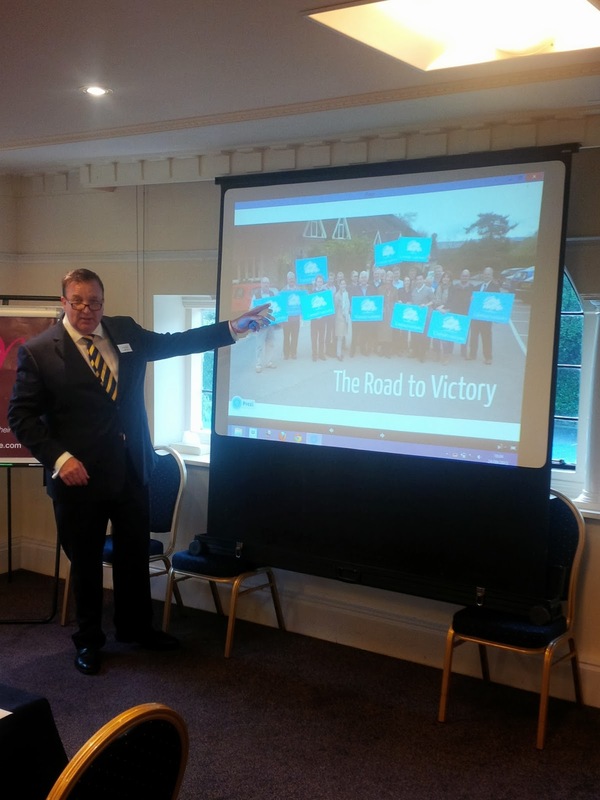 ﻿﻿﻿﻿For the first time I used my new presentational software "Prezi" (hat tip to London Area Deputy Chairman, Mario Creatura for introducing me to it). This is a much softer and more emotive way to tell a story than Powerpoint, and I really would recommend it to anyone who presents to groups or large audiences. 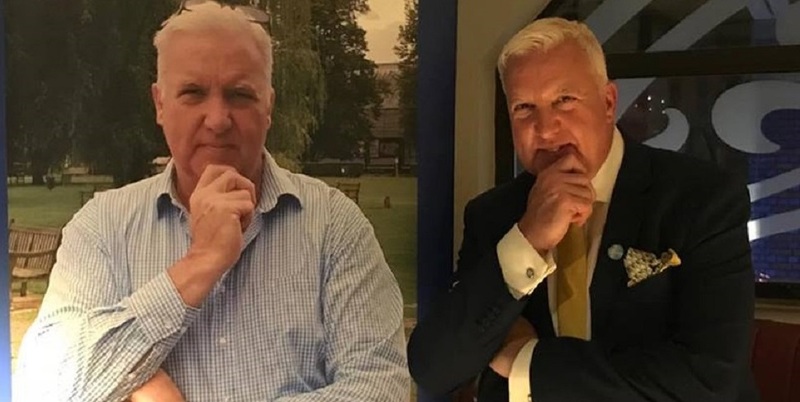 The evening was ably led by TW Chairman, William Rutherford, and Jacques Arnold (former MP for Gravesend and Chairman of T&M) proposed the vote of thanks. Overall, a very successful evening and a good start. I think probably two thirds of those who attended will complete an application form and take things to the next stage. We also have sufficient names of potential candidates unable to attend this time to run another event, with a third planned for the Chatham / Medway area later in the year. Many would take it as a personal afront. I see it as a lucky escape! "Thank you for applying for a ticket for the London and South East Region Reception at the Conference next Monday. Unfortunately we have been heavily oversubscribed with requests and have had to add you to our reserve list. One of the problems with this reception is that because there is no charge for tickets, a large number of people tend to apply for tickets without having decided whether to attend and although we take this into account we have to place a limit on the number of tickets we can issue. Experience shows that if those on the waiting list can leave it until around 8.00 pm or 8.15 pm to arrive it may well be possible to attend. Staff at the Conference Centre generally count people entering the room so we do not have any discretion over the numbers admitted." Wearing my "Kent Area Management Executive" hat, I was honoured tonight to be invited to the Executive Council Meeting of the Rochester & and Strood Conservative Association, where item 5 on the agenda was a motion to re-adopt Mark Reckless MP as Conservative candidate for the next General Election. This was a double honour, as I am a great fan of Mark Reckless and also a great supporter of the R & and S Association, one of the Association's in the South East who continually punch above their weight and do exactly what a well-managed and politically active Conservative Association should be doing. My duty tonight was to be the Returning Officer, explaining the procedure to the members, ensuring those who voted were eligible under the Party Constitution to do so, then to count the votes in the presence of an independent scrutineer. Whenever I am asked to preside over such occasions, I try to install a touch of theatre and ceremony. 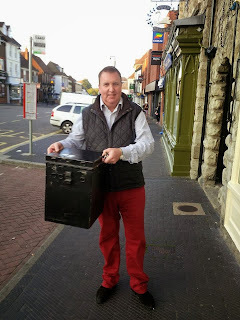 Rather than asking members to pass their ballot papers to the end of a row, then collecting them in a bucket, I always take along my traditional metal ballot box, which is checked to be empty, before it is locked and sealed. People seem to enjoy the formality (or perhaps they all know I am a Drama Queen and tolerate my eccentricities). Hopefully it will be used again at the Tonbridge & Malling selection in November. Let's be honest; the result of the ballot was never in doubt. Mark is an outstanding constituency MP and hugely popular with the local membership, when he speaks he does so to their hearts as well as their minds. What really impresses me on such occasions is how seriously the MPs take them. As with Tracey Crouch a few weeks ago, Mark was clearly respectful of the process and anxious about the outcome. And like Tracey a few weeks ago, he had nothing to worry about! All I can say in conclusion is how good it was to run a democratic ballot within the Conservative Party's constitution. Everyone there was entitled to be there; no doubts or suspicions about their eligibility. No-one was signed-up at a discounted rate by a trades union trying to influence the outcome. There was no need to suspect the outcome or launch an enquiry into the process. It's called democracy - ONE member ONE vote. Not something Labour would understand, after all they have a leader who was not elected by their members or their MPs, but by the tarnished votes of the Unite Union. I attach below a note I have circulated to all local Councillors and Conservative Branches regarding the purchase of wreaths for Remembrance Day. Over the weekend, the Royal British Legion circulated a form for organisations to order Remembrance Day wreaths. This has prompted a number of enquiries from members asking about the type of wreath they should purchase. Last year, there was considerable coverage in the national press when UKIP and the BNP laid wreaths with their Party logo printed in the middle. Upon investigation, it transpired that the Royal British Legion at Aylesford, who manufacture the wreaths, offer them for sale with various logos (including political parties) being printed on them. Notwithstanding the above, my personal view is that politically branded wreaths for Remembrance Day are inappropriate. Not only does it run the risk of parties being accused of politicising Remembrance Day, but I believe the majority of people simply do not want to see political logos emblazoned across wreaths laid at memorials. If you are laying a wreath on behalf of the branch or Association I think it is absolutely appropriate for the name of the branch/Association to be written on the card, i.e. "From Bill Jenkins on behalf of the Officers and Members of the Barchester Branch Conservative Committee". I hope this is helpful and we can avoid the risk of causing unintended offence. 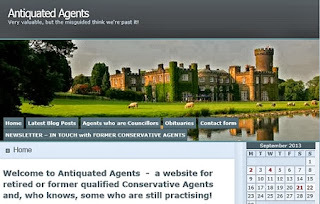 Antiquated Agents; very valuable; but the misguided think they're past it! Over the weekend Google Analytics alerted me to an unusually high flow of traffic from a website which had not previously provide a link to my blog. It was called Antiquated Agents. 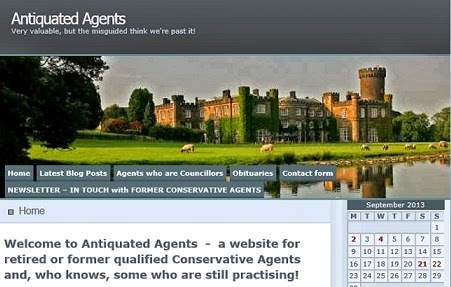 A quick click proved it to be just that; a website and blog for retired Conservative Party Agents. There was no imprint on the site, which surprised me as in those good old days before the PPERA imprints were placed on everything. In fact I was often surprised that it wasn't overprinted onto the lavatory paper. However, the quarterly newsletters are published by the truly lovely Lindsay Brooke. I first met Lindsey when she was the Deputy Central Office Agent (DCOA) for Wessex Area based in Salisbury, working with Donald Stringer and, if my memory serves, Leigh Jeffes. What a wonderful combination they were. Lindsey (Allinson, as I think she was then) was one of the most approachable, supportive and encouraging people I worked with in my early years. The fact that Wessex Area, COA and DCOA will be completely alien terms to most of today's activists is a sign of just how things have changed. I spent over an hour looking around the site, which produced some very mixed emotions. They publish a quarterly newsletter, unsurprisingly titled "In Touch" complete with Comic Sans type and lots of clip art. Plus ça change, plus c'est la même chose! One link contained a long list of familiar names, some of whom I knew very well, people who had trained me and in the early 1990s I considered friends and colleagues. Then a sudden jolt and deep sadness when I noticed the list was headed "Obituaries". 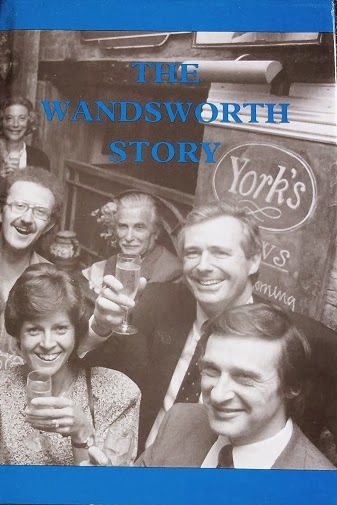 This was followed by the delight of seeing a contribution from Jean Lucas MBE, who (back in the 1970s) was instrumental in forming the Wandsworth Group and was for many years the Group Agent, helping to steer Wandsworth Council back from Militant Socialist control to the rock solid, cost-cutting Thatcherite council it has been ever since. The Group was formed to ensure all Wandsworth Associations shared costs, had professional cover and money could be focussed on campaigning rather than bricks and mortar. It is hard to believe that 40 years later we are still having the same arguments about grouping and sharing costs. Jean's book, The Wandsworth Story has been on my political bookshelf for two decades. I re-read it every few years and what they achieved still inspires me. Throughout the website there is a sad and at times an angry tone, not surprising given how badly many of them feel they were treated. There is also an inevitable "it wasn't like this when we were running the show" narrative, which I suspect we are all guilty of, though retired Agents seem more prone than most! The truth is, however, that our army of retired Agents are a massive resource who could, if asked, make a valuable contribution. How this could be handled however, without risking undermining their successors or the newly appointed Campaign Managers, would need careful consideration. After all, there is nothing worse than one's predecessor carping on about "how we did it in my day." 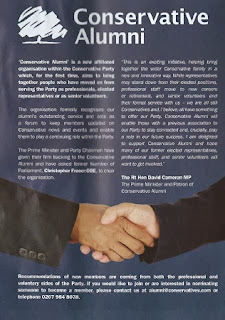 "...bring together people who have moved on from serving the Party as professionals, elected representatives or as senior volunteers.... to keep members updated on Conservative news and events and enable them to play a continuing role within the Party." 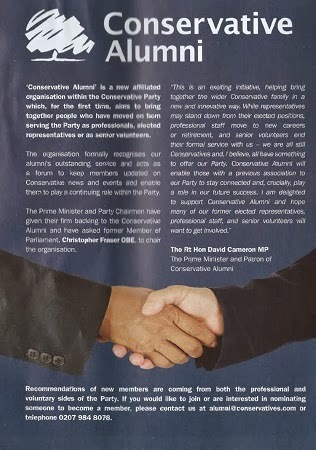 I hope Conservative Alumni is a success and finds a way of utilising the skills and bringing back into the Conservative family all of those who were perhaps made to feel they were no longer wanted, relevant or welcome in the post 1997 Conservative Party. We had teams out on the doorsteps today in the Sherwood ward in Tunbridge Wells (led by Greg Clark MP) and in the Wayfield area of Chatham (led by Tracey Crouch MP) with a special and unexpected guest appearance by Richard Ashworth. MEP. Campaigning in Tunbridge Wells - from left: Sherwood Councillors Bob Backhouse and Frank Williams, Kay Williams, John Cunningham. William Rutherford (Association Chairman), Greg Clark MP, Julian Stanyer, Barbara Cobbold,Sherwood Councillor Lynne Weatherly, Alan McDermott, Jane March and James Tansley (and Cllr David Elliott, who took the photograph and organised the day's activity). In the last few days I have received five or six emails asking about the relationship between the candidate / MP and the Association. Applicants ask what type of person the membership will be looking for, what role they will be expected to have with the Association and if they should make specific commitments should they be invited for interview (ie, pledge to increase membership by x%, or form Y number of new branches) etc. 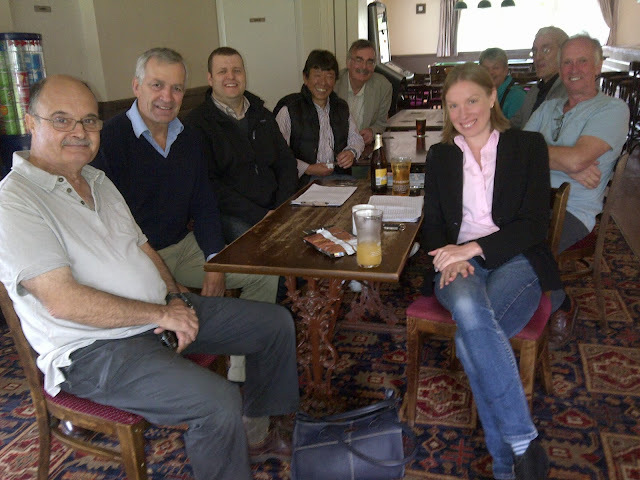 The relationship between an MP and the local Association, or his or her constituents, has always interested me. I recall one story, told I believe by Gyles Brandreth when he was MP for Chester, welcoming Douglas Hurd (then Foreign Secretary) to the constituency for a campaign visit. As they walked alongside the River Dee for press and TV pictures, someone decided there should be a photo of them feeding the local ducks. Bread was produced and the Foreign Secretary and the local MP then spent 10 minutes on their haunches, waddling along the towpath, proffering bread to already overfed and disinterested waterfowl. After a few minutes, Douglas Hurd apparently turned to Gyles Brandreth and said sotto voce, "I suspect Neville Chamberlain was never asked to do this". I have previously mentioned to the MPs I work for that I regret Parliamentarians are now regarded as local celebrities rather than legislators, and how much better it would be if we didn't expect our MPs to spend their weeks in Westminster and their weekends judging Bonny Baby competitions, awarding prizes at dog shows and picking out raffle tickets at the annual Barchester ward (processed) Cheese & (undrinkable) Wine evening. Some secretly agree though believe the battle has been lost. Others, I suspect, quite like the celebrity and recognition, though I doubt any sane person could actually be sanguine about being followed around Sainsbury's by some random loon, Tweeting the contents of their shopping trolley. Anyway, for what it is worth, here is a sample of the reply I sent to the various prospective candidates seeking my views on what "relationship" the Association might be looking for and how I felt candidates should interact with the wider membership. I would personally welcome and support any measure which might bring new people and activists into the fold. I don't think I have ever said "that won't work" or "we cannot do that as we've tried it before". I have no time for such negativity, which simply drains energy and leads people to feel their views aren't welcome or valued. Probably 50% of my ideas fall flat, 30% have limited success and perhaps just one or two in every ten meet or exceed our expectations. However, if we didn't work our way through the 8 ideas which did not achieve what we hoped they would, we would never find the one or two that did take off and fly. A case in point being our local candidate recruitment campaign. The main plank of the campaign (the full-page press advertisements) was a complete flop, producing nothing from an expenditure of over £1,300. However the flyers to local community groups have identified around 40 potential new candidates. I think your email however is indicative of a wider issue we must address as a party and perhaps even on a wider scale. It is a tragedy that those who seek to serve in Parliament often see themselves, or allow themselves to be seen, as "activists and celebrities". This doesn't mean that candidates and MPs should not campaign - far from it. Indeed, they have a duty to do so. With all parties facing an ageing and declining membership, and in many parts of the country hardly any organisation whatsoever, it is understandable that many candidates are forced to become the "campaigner in chief" (as without them taking the lead, nothing would happen). However, the next stage they are defined as "local celebrities" and not as legislators and Parliamentarians. In the never ending battle for profile, many become better known for appearing in the local pantomime, tossing pancakes for charity and painting dilapidated scout huts. If this is what the public really want from their legislators then so be it, but I think it is a sad day. 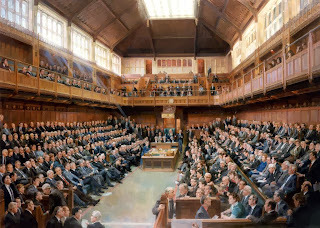 Personally, and perhaps I am a bit old fashioned in this, I want my MP to be first and foremost an advocate for the people he or she is elected to represent, to scrutinise and seek to amend bad legislation and to hold an ever increasingly powerful Executive to account. I cheered over the vote on Syria, not solely because the motion failed, but because Parliament stood firm against the Executive, perhaps for the first time in a generation on such an important issue. That is why electors send people to Parliament, and that is, I believe, how Members of Parliament should be judged. Whoever is selected for T&M will be fortunate in that if they are subsequently elected, they will inherit a local party, and a constituency, which has, for 40 years, elected to Westminster a Parliamentarian and legislator. I think any candidate would be wise to consider if they so quickly wish to redefine that relationship, and allow themselves to be judged not on their oratory, their ideas, their beliefs, and hopefully their record as a legislator - but on how many new members they have recruited or branches launched." Cllr Anna Firth from Sevenoaks DC has just sent me the following list of the top ten bizarre enquiries received by various local council's customer services teams. 8. How do you make a marinade to put on my barbecue steaks? (Newark and Sherwood District Council). 9. A lady rang to say she couldn't get any reception on her TV. She'd already contacted the police and the fire brigade but they couldn't help, so she called the council (Rossendale Borough Council). I'm not gay, you know! Amusing incident of the day. "I thought I should just make clear that I am not gay ! Though I am very liberal and have lots of gay friends." Not quite sure he assumed that I would think he was. It gave us all a laugh though, in between the monotony of printing and packing raffle tickets! Herding the many elephants in the room ! It's frantic at West Kent Towers right now - with Jon and I spinning plates and juggling over 40 different events and activities happening across our Associations. 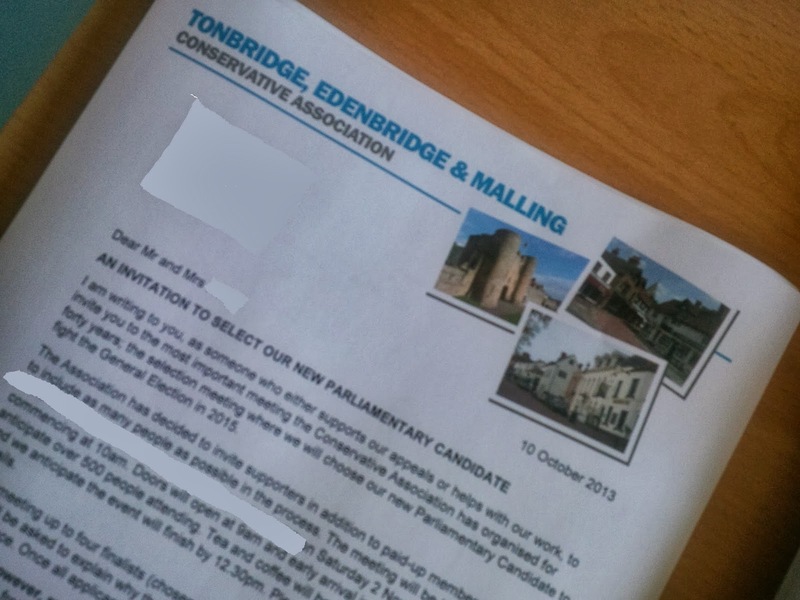 The ever nearing Tonbridge & Malling Parliamentary Selection. Potential applicants have just one week left to submit their CVs to CCHQ. Next Wednesday we have our Executive Council to "sign-off" the procedures. I am in the middle of designing my presentation outlining with how I hope the process will not only lead to the selection of an outstanding candidate, but will also be a vehicle to refresh and renew our local organisation. We are bursting with ideas and I look forward to sharing our plans once the Executive Council has agreed the process. Local Government Candidate Recruitment: Next Tuesday we host our first evening for training and recruiting new LG Candidates. Almost 20 brand new candidates have now accepted our invitation to attend with another 20 in the pipeline for the next session. I don't think we have ever had 40 potential new candidates, another super opportunity to bring in fresh ideas and new thinking. Christmas Draw: As well as running the Christmas Draw for the three West Kent Associations, we are also looking after Rochester and Maidstone, too. In addition, we are targeting 6,500 known Conservative supporters in Chatham & Aylesford in an initiative to identify a new generation of donors to help ensure a solid financial base as we head towards 2015. All of this results in mail merging and packing over 10,000 envelopes, consisting of 14 variations of the appeal letter targeting different target groups! 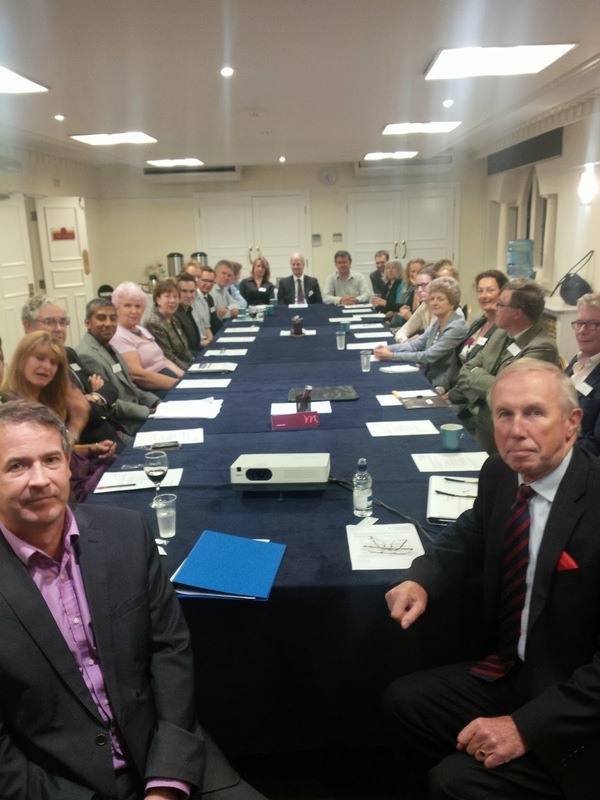 Development of West Kent: As hinted at in previous blogs, we are in the process of major changes to West Kent including a possible new Campaign HQ, new Memorandum of Understanding governing how we work and the services we provide and new Associations applying to join the Group. All of this involves a great deal of behind the scenes negotiations, quasi legal work drafting the potential service agreements and writing briefing notes for the various Executive Committees. 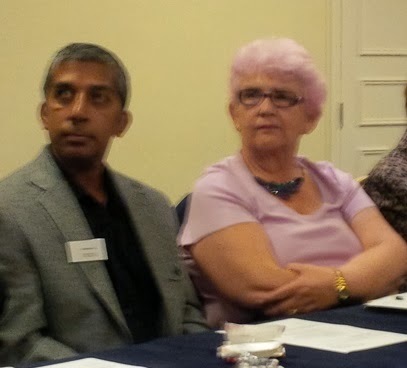 Voluntary work with the Kent Area Management Executive: As well as my paid work with West Kent, I am also a co-opted member of the Kent AME, where I have responsibility for Best Practice and Special Events. 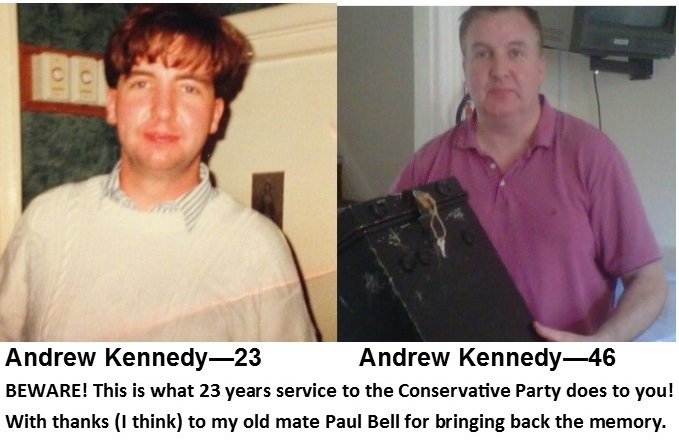 This is a voluntary appointment, where I work alongside other volunteers helping administer the affairs of the Conservative Party in Kent. In this capacity I am organising the Kent Reception at the Conservative Party Conference and commencing work on the 2014 Kent Area Conference, which will be held in Sandwich. I am also honoured to have been invited by my colleagues in Rochester & Strood to oversee the vote to re-adopt of outstanding Mark Reckless as Conservative Parliamentary Candidate. Events and Fundraising: As well as our branches raising funds (and central fundraising such as the Christmas Raffle) our various Management Committees also host high profile events, which fall on the Office to help organise; of which we have four! Tunbridge Wells are hosting a Murder Mystery Dinner in October, Tonbridge & Malling have a supper with Ann Widdecombe in November, Chatham & Aylesford have a Horse Race Night in November and we also have a West Kent Magic Show at Tonbridge's Oast Theatre early in the New Year. Oh yes, and we are organising Sir John Stanley's 40 Year Anniversary on 15 Tonbridge - with 150 of the 200 available tickets already sold! All of the above are just special " one off" events - we also have the routine day-to-day activities which every Association Office must deal with; membership renewals, minutes, branch development - and most importantly of all, campaigning (which is the reason we are here). Each of the Associations now have weekly campaign teams - each generating hundreds of new VIs all of which must be data captured. With the Labour Party and the Trades Unions predictably "frothing at the mouth" about the forthcoming privatisation of Royal Mail, I thought I would publish a simple "Is it Broken - Does it Need Fixing?" quiz. Through the various Conservative Associations I work for I consider myself a major user of Royal Mail services. Last year we spent over £20,000 on postage, and regularly use six different RM products, from normal over the counter stamps, pre-paid franking machine, Mailsort, Online Business Account, Freepost and Reply Paid. Q1. If you ran a delivery company and a customer spent £2,700 in one day, and had ordered from you 40 mail sacks which you forgot to deliver despite confirming the request in writing, what would you do? 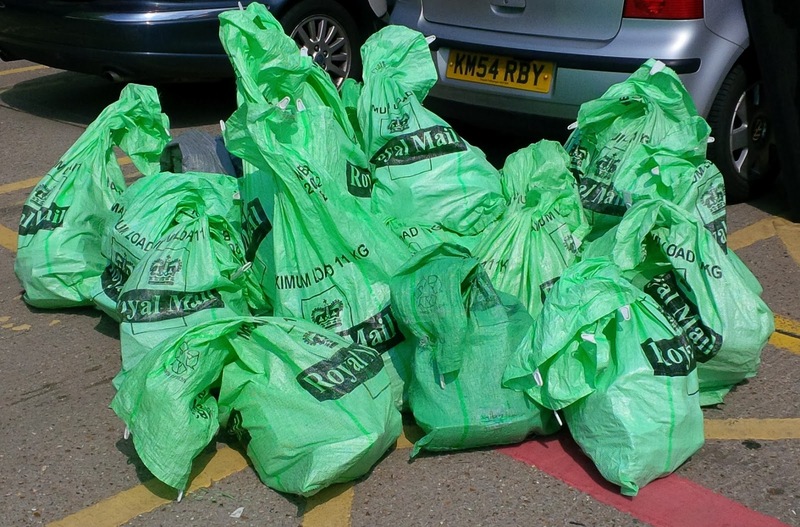 (a) Apologise and arrange for someone to drive around from the local sorting office (3 miles away) with the missing sacks in order to fulfil your obligations to your customer. (b) Apologies, but ask the customer to put the franked mail in whatever sacks and boxes they had to hand, and arrange to pick these up as planned. (c) Tell the customer that a written confirmation is sent from Head Office and it's not the fault of the local depot. Refuse to deliver the sacks as "it's not my job". Advise the customer that unless the mail is sacked properly, you will refuse to collect it - and say that it is the customers responsibility to obtain the sacks by driving around local post offices asking for spare sacks wherever they could be found. Q2. If the customer referred to above was only able to obtain 30 sacks, resulting in each sack being 25% overweight, what would you do (bearing in mind it was your fault that the sacks were not delivered)? (a) Bring a few spare sacks with me in case their was a problem, and spread the load (as you would have to do if the letters were placed in a post box). (b) Take the mail without complaint, after all the customer has just spent £2,700 and it isn't his fault he didn't have the sacks. (c) Make a complaint to your Trades Union rep, who in turn informed the Health & Safety Officer, who could then write to the customer pointing out that the mail sacks were overweight and threatening to withdraw services and possibly take legal action if the over packing of mail sacks occurred again? Q3. if a customer who spent £20,000pa with you requested and paid for five private collections (ie, where your van calls at his office to collect sacked mail) how many of those pre-booked, pre-paid and confirmed collections would you ignore? (c) All five of them. It's all the fault of Head Office who take the bookings and expect us to read the email. Q4. If your company was losing money and staff were facing redundancy, and a customer accidentally sent 5,000 items of OBA pre-franked mail but only enclosed a payment certificate for 3,000 items, what would you do? (a) Immediately phone the customer and request the missing payment, withholding the mail until the short payment was received? (b) Realise the error when reconciling the paperwork and inform the customer of the debt? (c) Do absolutely nothing until the customer phoned your Revenue Department and a admitted the error, at which point you can blame the system for not picking up the discrepancy. Q5. If you fail to pick up a customer's 8,500 items of post which are dated and time sensitive and need to be in the system that day, what would you do (bearing in mind they had just spent over £3,000 with your company)? (a) Apologise and send a van around immediately? (b) Explain that all the vans are out and there is no way to reschedule, and ask the customer if they could bring the post around to the local sorting office? (c) Tell the customer to bring the post to the sorting office then criticise them for daring to enter Royal Mail property without authorisation, then keep them waiting for an hour as the two people trained to unload sacks and push trolleys are both unavailable until 2pm. Now. most companies (or their local employees if they cared about their customers and wanted to increase sales and protect their jobs) would choose Answer A. Fair enough, a few may choose Answer B, that's human nature. Sadly, in the cases highlighted above, Royal Mail's answer was C every time. They say "pictures paint a thousand words"! With the deadline approaching for potential parliamentary candidates to submit their application form, it is understandable that they will be seeking as much local information as possible. This has resulted in many councillors and activists receiving random phone calls asking for meetings to discuss local issues. One councillor who spoke to me over the weekend received eight calls, which he understandably found intrusive. Whilst any decision to meet or speak to applicants is one for you to make personally, my general advice to all members is that this should be avoided, particularly if you are a member of the Executive Council and will therefore be on the interview panel. If you do agree to speak to an applicant, as a matter of fairness, you should offer the same opportunity to all of them (and there is likely to be 300!). To talk to some and not others could be considered as unfair, and regardless of what is or isn't said at such a meeting, applicants who have not had the opportunity to talk to you may feel disadvantaged. Imagine if you had applied for a job and you discovered after the interview that a number of the other applicants had held private meetings with members of the interviewing panel. You would naturally feel that those applicants had received special treatment and had an advantage. I think we should do all that we can to avoid any such feelings and ensure there is a level playing field for everyone. I have produced a written "constituency briefing" which is available via the Association's website www.tcconservatives.org or it can be emailed to applicants if they contact the Association office. If you are contacted, I strongly recommend that you ask the caller to phone or email the office for a copy of the briefing paper. This will not only save you a great deal of time but will also ensure that all applicants are treated equally and fairly. Another reason why I keep writing this blog! Back - and raring to go! A kind email from a grateful potential applicant!